← The customer is always – irrelevant? I’m elitist and snobby. Unadventurous. Uncultured. They’re just a few of the things I’ve been accused of being. No, not by trolls, nor disgruntled readers. This is some of my friends I’m talking about. Because I’ve not seen ‘The Lord of the Rings’ films. Or ‘The Hobbit’ films. And you know what? I never, ever will unless someone handcuffs me to a chair, tapes my eyes open and forces me. And then, trust me, I will sing ‘la la la’ throughout and forever hate him or her, whoever it is. When I was very young I read – and loved – ‘The Hobbit’. A little older and I read ‘The Lord of the Rings’ for the first time. The first of many times. So many times my original copy (all the books in one volume) fell apart and I had to buy a new one. But it is a bit of a Marmite thing, ‘The Lord of the Rings’. Someone I know (you know who you are) calls Marmite the Devil’s earwax. There are probably people who think ‘The Lord of the Rings’ is … well, best not go there, perhaps. But, it seems either you either love it – or think it’s sad, silly and childish. When I was eight ‘The Hobbit’ was deemed appropriate. A children’s book, read by a child. By the time I reached my teens and became one of many fans of ‘The Lord of the Rings’, a bit of a backlash was beginning, notably in the USA where ‘Bored of the Rings’ took off in 1969. Even way back then, some merchandise was circulating – though I only recall posters. I had one, of Shadowfax. Still have it. But a poster of a white horse and generic wizardy bloke wasn’t enough to spoil my inner vision. You see, that’s why I won’t see the films. The book – its characters and its settings, its rugged mountains, dwarves and elves and Ents – has taken root in my imagination. I have my own vision of Tolkien’s Middle Earth – I don’t want anyone else’s. the jolly, lusty voice in my head is the voice I imagine. The bounding chap in yellow boots – who isn’t there, but could be – he’s the figure I imagine. 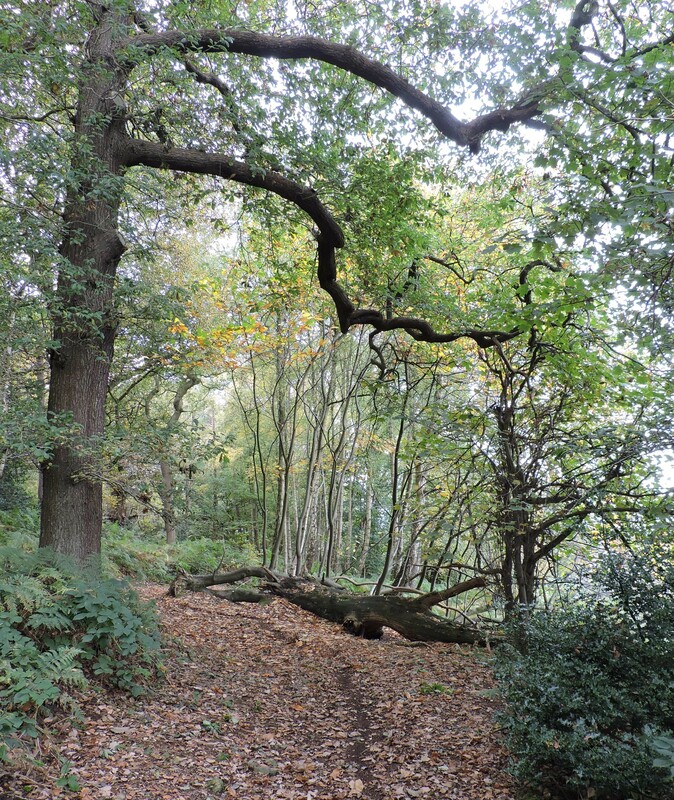 The biggest of the many trees around me are not just oaks but Ents – my image of Ents. We’re walking in woods. They’re wrapped like a scarf around the base of a castle mound. I’m captivated by the ancient oaks. I don’t even try to take a picture. It would be an intrusion. The real image could never be captured. It’s as if the Ents are making ready to speak. Telling me their image is too slow, too old, too living to imprison in pixels and bytes. I suppose it’s the castle making me feel all fairy tale and romantic. Ruins do that, don’t you find, when the weather is right? Misty, thundery, moonlit – or gorgeously autumnal, like today. 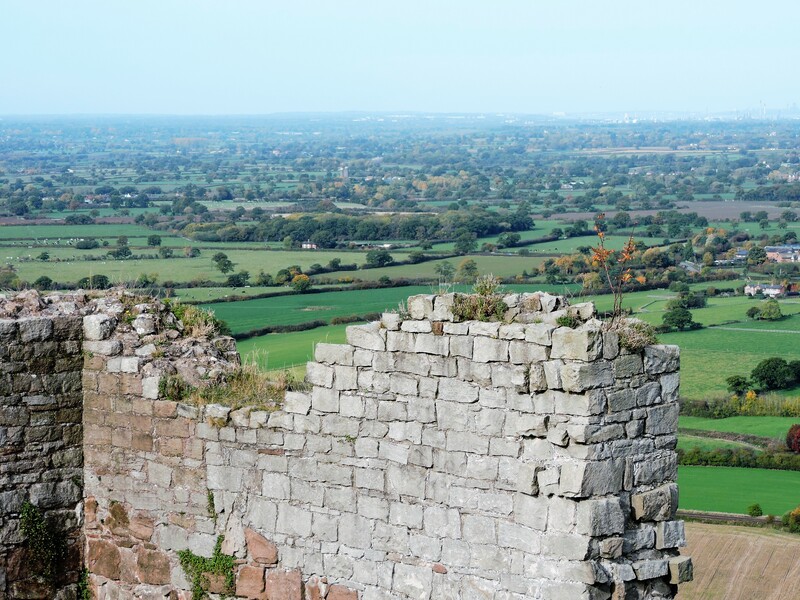 Beneath the jagged castle’s beaten battlements lie remnants of Bronze and Iron Age settlements. Humans have long lived here – you can sense it. The site feels deep, dense with once-lived moments – and still alive. Teeming with natural life, if not – any longer – with humans. Except for tourists. The castle was destroyed in our civil war. Parliamentarians versus Royalists, the interpretation boards call them – I knew them as Cavaliers and Roundheads. Whatever their names, they fought each other, there was a siege, the building was ravaged – and who knows who really won in the long, long run. Except nature. 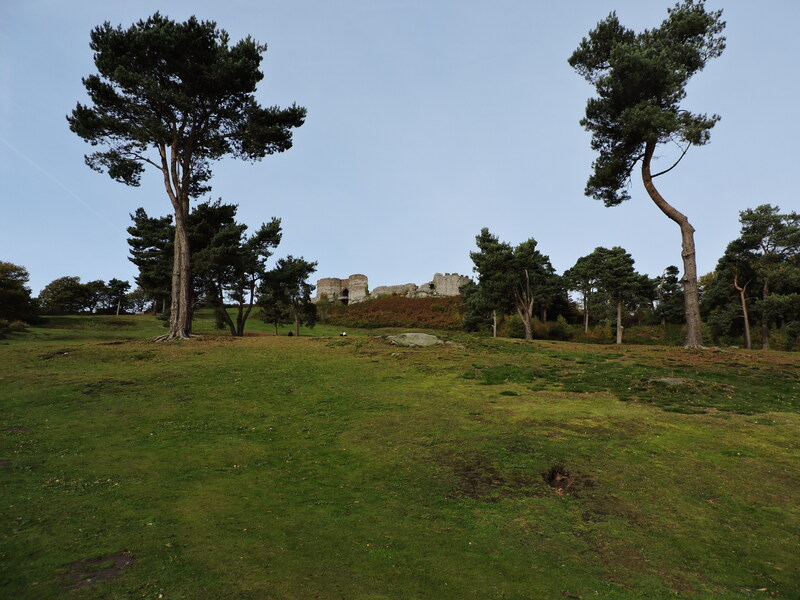 As befits a fortress, the climb up is fairly steep – but nothing compared with drop beneath the bridge that spans the gaping defensive ditch to the castle itself. That ditch goes a long way down! ‘Sheer drop’ says the notice. No kidding. It’s terrifying. Eyes straight ahead, hand clasping the cold metal rail, I try hard to think of something nice. Like lunch. It’s worth the fear for the views. A hazy day, but even so, there’s Liverpool, twenty two miles away and both cathedrals visible – just – to the naked eye. There’s Jodrell Bank’s huge radio-telescope. And there – the Welsh Mountains. Vistas stretching in all directions. A strategic location, close to a border – one of those invisible man-made lines on a map that tend to encourage conflict. Dropping down, towards the base of the mound, the woods begin. A strange, large black bird makes an odd call, impossible to describe. Then it clicks its beak, quickly, a sound like an expert knitter, plying metal needles. Perhaps it isn’t a real bird. Perhaps it’s a witch’s familiar – or an emanation, a ghostly rara avis? It’s this place. These woods. They’re enchanting, if not enchanted. I stand, dumbstruck, before a vast oak. Huge, barrel of a trunk bristling with former branches. Dark, gnarled limbs bared by the dying foliage as it descends. The path beneath our feet glows yellow and orange, leaves outlined in blackness – the dark soil. Created by centuries of leaves dying. Being eaten by worms. 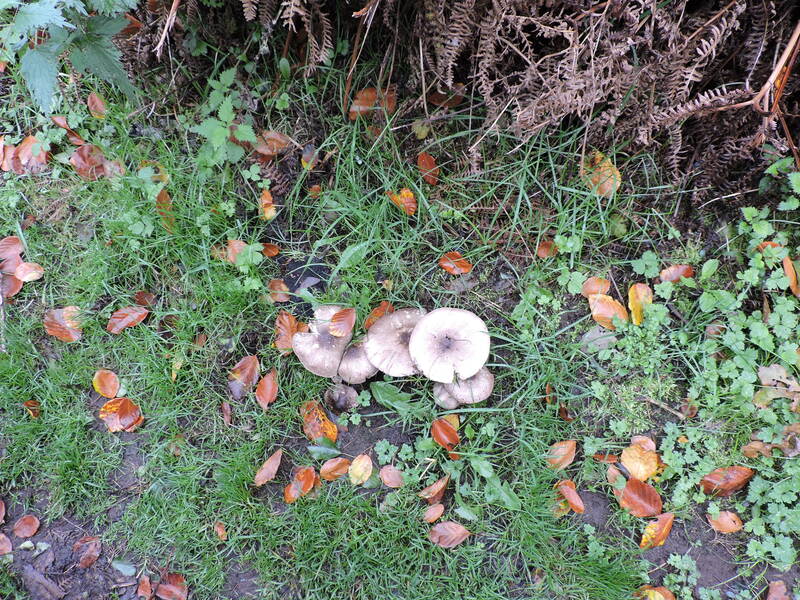 Excreted as a life-giving food for the greenery that will burst forth next spring. Some trees have fallen – but are still rooted. Just. Enough so that what should be branches now shoot upright like small young trees. Seeking the sun above the birches and beeches, hollies and hawthorns. English Heritage runs the site. They’re losing Government funding and we decide to join. We’ll drop the National Trust. Seen plenty of stately homes. We’ll make do (happily) with ruins and earthworks. Places imagination can roam free. With isolated chapels and ghostly barrows. Barrow wights? Yes, I’ve imagined them, too. All of a sudden the world turns cold. Imagination – a powerful, personal thing. 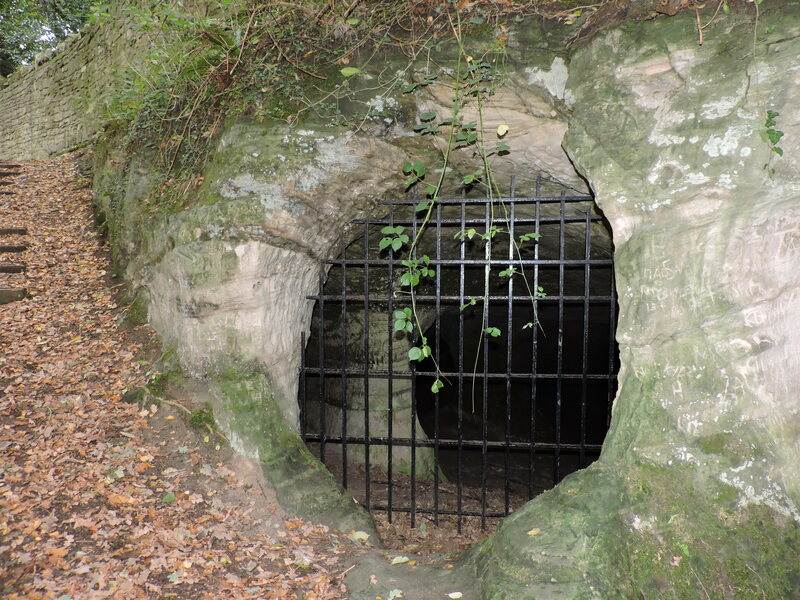 This entry was posted in Art, jaunts & going out, Britain now & then and tagged Barrow wights, Beeston Castle, castles, Cheshire, Ents, Imagination, oak trees, Roundheads and Cavaliers, The Hobbit, The Lord of the Rings, Tom Bombadil. Bookmark the permalink. 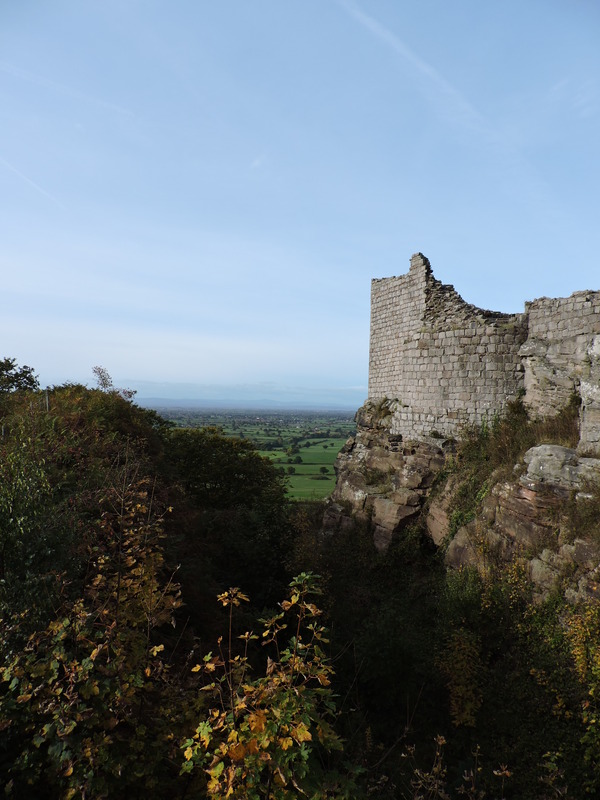 I was only reading Christopher Somerville’s walk to Beeston Castle in The Times on Saturday and thinking it is about time we paid another visit. The last time was when the children were young, many years ago now! You’re piece has increased my determination for another visit. 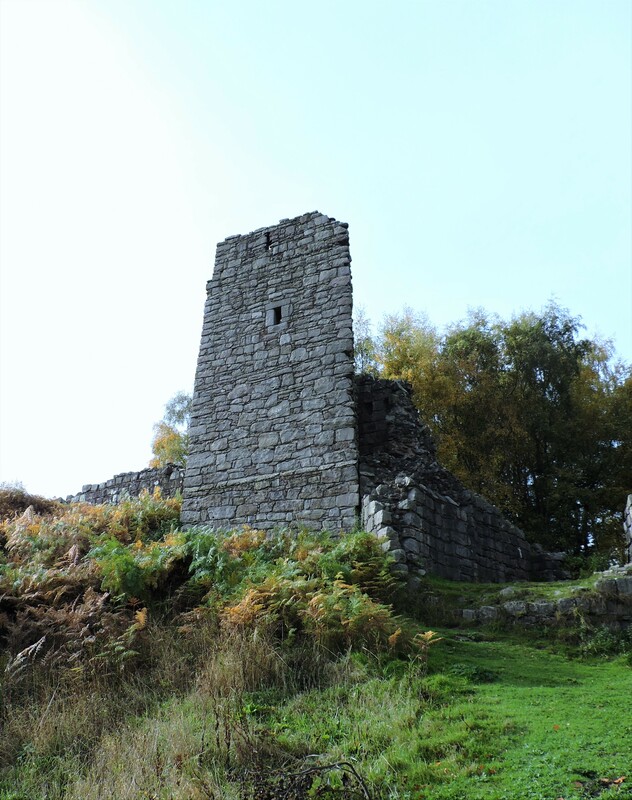 Yes – that’s what sent us there on Sunday – we’ve never been before – it must be one of the few castles in the northern part of the country my dad missed taking me!It was gorgeous and not as busy as we thought it would be given the Times write-up. The views – wow! I haven’t seen ‘Lord of the Rings’ either and we both share the same views on Downton Abbey. I did see Titanic, though, three and a half hours in the company of two teenagers, one of whom started sobbing as the title sequence came up. Oh no – nightmare Titanic! I just couldn’t bring myself to watch it because I know what happened and it’s sad enough without a soppy story attached – and music – I’d have been puffy eyed for months! My brother brought the Hobbit and Lord of the Rings home from college. He’s still a fan and has seen all the movies. Me? I’d rather not. Gorgeous sites – they do have a feeling about them. 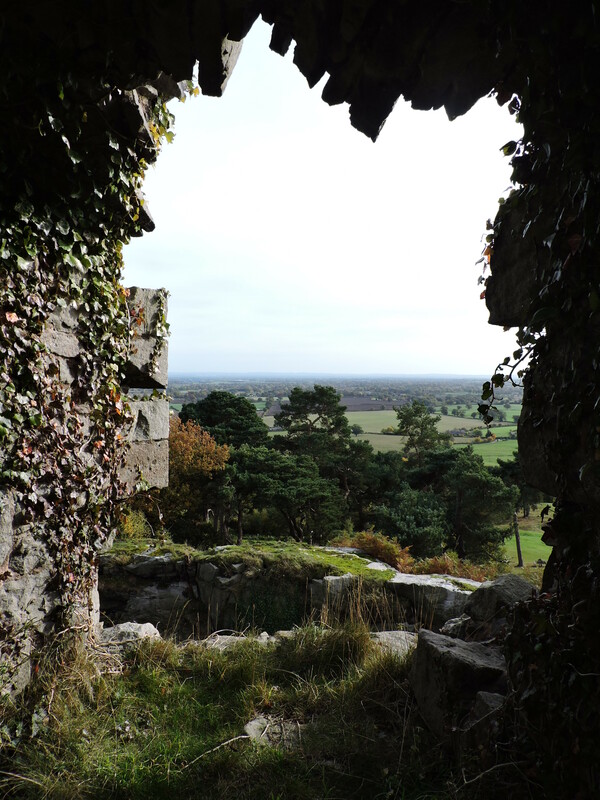 Hi Mouse and thanks for reading and commenting – yes, the castle, the views and the wealth of ancient trees really does something – not quite time travel but dimension travel. But then I’m a bit of a romantic! Was an ardent fan of the books, but in the same way as I chose not to see Out of Africa, I would even more, because it’s entirely imaginative fiction, and one has one’s own imagined idea, have elected not to see the films – had I even had the opportunity. Exactly my point of view. But I loved Out of Africa despite Robert Redford! Have you been to this castle. Beeston, Cheshire? Well worth a visit if you are round these parts. I hope all is well with you – my turn to apologise for a late email reply, methinks!